AZALEA has been completed in 2015 to become an esteemed addition to the charter market. 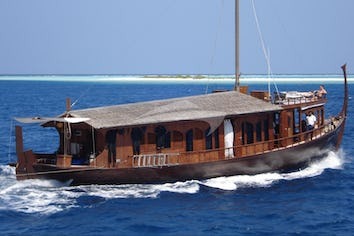 With the ability to facilitate up to 18 guests, she is an exciting charter option for exploration in the Indian Ocean. Her notable collection of water toys includes jet-skis, a wake board, paddle-boards, three Seadoo sea scooters, a kayak, water slide and water golf, guaranteed to keep friends and family endlessly occupied in the sunshine. If this isn’t quite enough, outdoors is host to a spacious swimming platform whilst her sundeck is appointed with a 6-person Jacuzzi and surrounding sun pads, ideally located for unwinding and relaxing in privacy or with other guests. On decks below a variety of sumptuous seating areas and shaded al-fresco dining options offer the perfect place to socialise. Charter yacht AZALEA's interior boasts an exceptional contemporary feel with delicate shades of greys and whites splashed with bursts of deep reds and blues running throughout the cabins and saloon in a timeless style. Her furniture is designed with soft retro curves contrasted with modern edges to produce an elegant and comfortable finish. 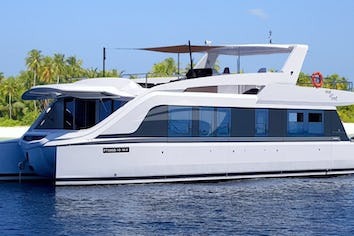 A unique and desirable feature is her ability to accommodate up to 18 guests configured across 9 cabins - a master suite fitted with a Jacuzzi in the en-suite bathroom, two VIP and a further 6 twin cabins. 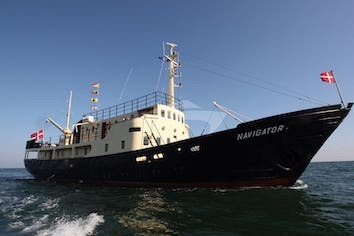 With the latest entertainment systems including a 3D curve TV, play station, a photo lab complete with dry cabinet and camera and lamp charging, and a selection of board games she offers something for everything, making her the perfect yacht for socialising and unwinding. She is capable of reaching 16 knots, with a cruising speed of 14 knots.